The Astrocloset was designed to be a roll away building for a permanent scope set up. It is mounted on rails, set on a wood or concrete viewing deck with a cut out for a permanent pier, or pad for a dob. This separates the building and the walking surface from the footing for your scope. The Astrocloset anchors to the rails covering your scope when it is not in use, then unlocks and rolls away for viewing. When set on a pier, most scopes of your size will fit through the door of our standard unit. However, due to viewing conditions (obstacles), some clients have asked for a stationary storage building for their mobile scopes, and this is easily accomplished with a few hardware changes…no need for the rails. How does the Astrocloset keep my scope cool? The Astrocloset has four 4″x 16″ louvred screened vents about a foot high (to prevent splash back), one in each corner panel for incoming air. The roof structure overhangs 1-1/4″ past the building on all sides and then extends down below the “top” of the Astrocloset (this space is also screened), allowing for convection to cool your scope. We also have insulation available to help ward off the heat, and flower boxes to grow sun blocking plants for a truly “green” cooling effect. 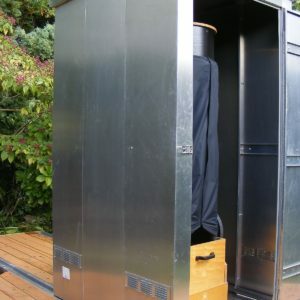 The insulation is easy to install, and in addition to the cooling effect, this insulation is flat black to eliminate reflected glare for a dark imaging station, or a warming station for reading star charts. How does the Astrocloset secure my scope? The Astrocloset locks onto its railing at each corner of the structure. A bent bolt passes through a slot in the railing and turns 90 degrees to hold it in place. It is imperative that a locking pin be placed in the anchor bolt, in each corner to prevent it from inadvertently vibrating to the unlocked position(from wind or other sources). The building has withstood 65mph winds with no discernible damage. It is currently being beta tested for extreme wind conditions, of up to 100mph. We now recommend adding a tie down strap, from front to back over the corners on each side, if you are expecting extremely high winds (65+mph). The building comes with a keyed locking hasp for entry security. How does the Astrocloset seal at the bottom? The Astrocloset has a nylon brush threshold seal with rain cap for the bottom of the structure. 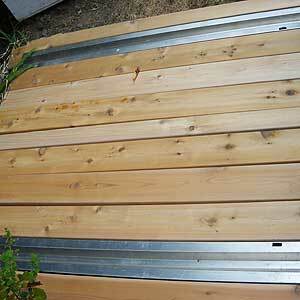 Wooden thresholds (decking) are placed perpendicular to the rails at the front and back of its parked position. These, as well as the rails themselves, are slightly tilted to the outside of the building for drainage. Under normal weather conditions, this works well. In extreme conditions of combined wind and rain, moisture can penetrate past the seal at the floor level. Storms such as these are usually predictable and simple preventative procedures can be taken. Are larger models of the Astrocloset available? The next standard size Astrocloset is 5′ x 5′ x 8′, with a door opening of 46″x 84″. However, if you can configure your scope (angled/tilted/lowered) to fit into a virtual box 34″wide, 84″tall, and 52″deep, the smaller size will do. Astroclosets can also custom design units to fit your scope. Is Astroclosets still accepting Beta-testers? 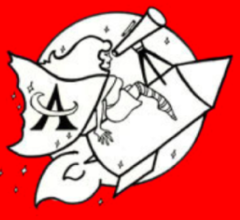 Astroclosets is still accepting Beta-testers. We are for looking for Beta-testers living in areas with a variety of extreme weather conditions (heat, cold, high winds, heavy rainfall/snowfall, etc.). Qualifying Beta-testers will receive a $150.00 discount, with a request for feedback on the siting, assembly and use of your new building. Photos will be appreciated, so we can recommend modifications, if necessary. Please mention your interest in the Beta-tester program prior to purchase.